Co-op third-person horde shooters are tricky to get right. Make a bad one and you’re accused of being a poor Left 4 Dead clone. Come to think of it – do it well and you still risk being seen as copying Valve’s masterpiece wholesale. This is a genre in which it’s hard to make a name for yourself. 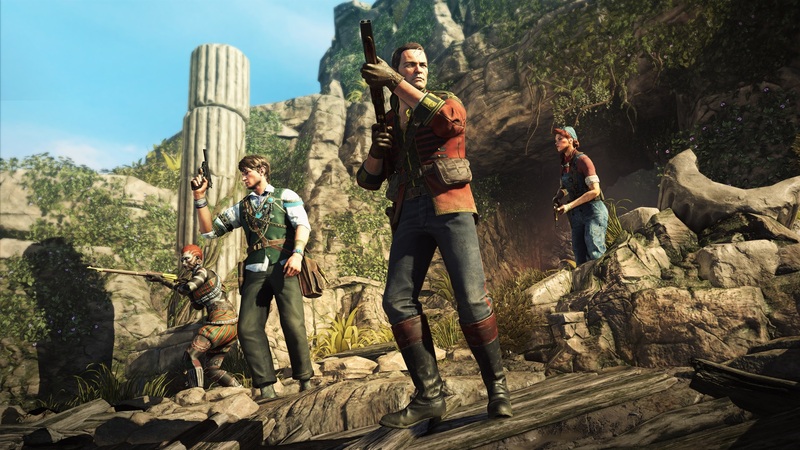 While Strange Brigade doesn’t feel mechanically much different from other games of its ilk, the 1930s setting certainly livens up the experience. 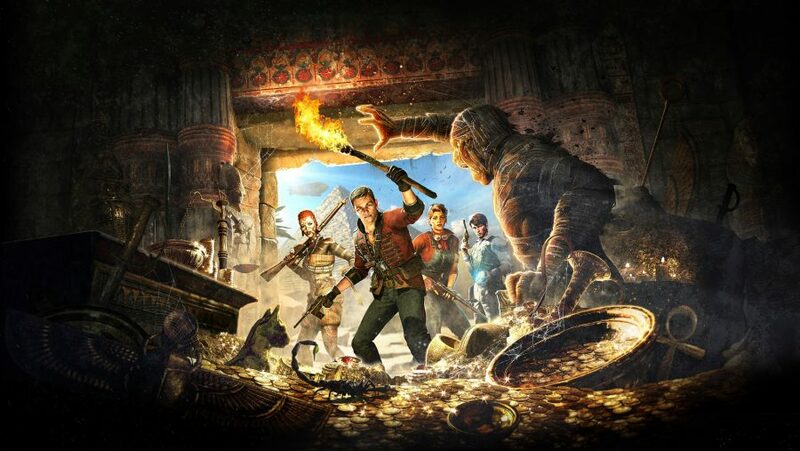 Full disclosure: I’m a sucker for anything involving Ancient Egypt, but in Strange Brigade, developer Rebellion has really captured the camp, pulpy, sepia thriller movie vibe. To begin, you step into the well-worn shoes of one of the members of the ‘Department of Antiquities’ – a team of gun-toting, globetrotting adventurers – who are on the search for ancient riches. Look, there’s only so much care and respect you can give to antiquities when they’re surrounded by the undead, ok? 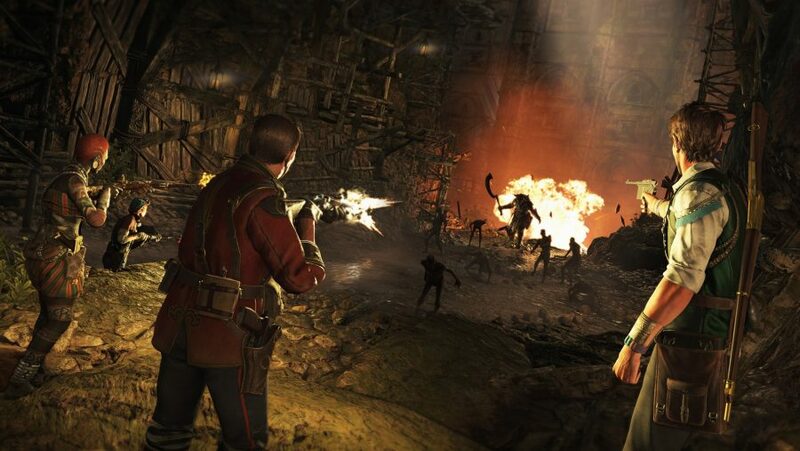 Your exploration and firefights in and around ancient tombs are bolstered by the continual quips and puns of an exuberant middle-class narrator, which isn’t nearly as annoying as it sounds like it might be. In fact, it acts as an excellent reminder that the game really shouldn’t be taken too seriously. The game launches with four characters to choose from – all of them suitably kitsch – with an additional four on the way as part of a season pass. I spent the majority of my time playing Gracie, for no other reason than she’s a Lancastrian and I’m from Humberside. Other ends of the British Isles, sure, but there are so few northern accents in games that we have to stick together where we can. "It became obvious the ‘30s serial tone with that British pithy voiceover was one that no one had really explored," studio director Ben Fisher says. "Once we started along that road it seemed like a really natural way to keep going. You get to punch a mummy in the face, what's not to love?" I thought I’d find the accent and voice lines a tad offensive, but they were so tongue-in-cheek, so far beyond ridiculous, that they actually prove charming. At one point I unleashed an ultimate magical attack to a war cry of ‘ECKY-THUMP!’ and was instantly satisfied by my character choice. You’re encouraged to have a diverse party composition by the fact that certain characters have special traits – such as the archaeologist Archimedes who is able to open hidden doors – which should prevent online players favouring the typical team of chisel-jawed men every game. Strange Brigade’s main attraction is a story adventure that can be played solo, but is more obviously designed for multiplayer mayhem. What sets it apart from other co-op shooters are the occasional puzzle sections that break up the action. These are mostly generic minigames that keep you engaged in solo play as you shoot mummies. They don’t work so well in multiplayer. In my session, my team and I were too caught up in gunning down anything that moved to give the puzzles a proper go. When one completionist player did hang back to try and crack the code, it held up the game for the rest of us, the wild impatient gunslingers. With a group of friends, rather than randos, the puzzles could be rewarding to solve. But much like the collectables – which add a degree of replayability, even if it’s to shoot a cat statue you missed – the puzzles are only sideshows to the main event: shooting hordes of nasties. Unfortunately, the big letdown of Strange Brigade for me is the gunplay. The guns crack and flash satisfactorily but the problem is one of accuracy. 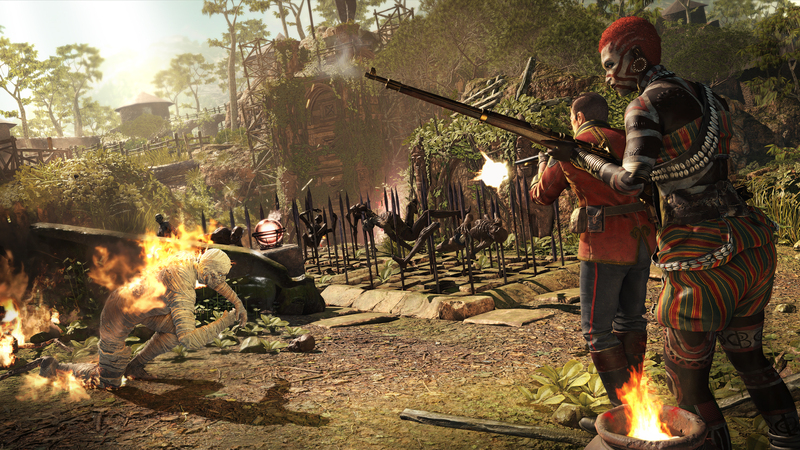 Strange Brigade is a third-person shooter – not first-person. In order to fire your weapon you first need to hold down a button, which takes you into an over-the-shoulder view, and one with an unusual angle. Often, I was thrown off as to how much distance there was between an enemy and my character, and even as to where enemies were positioned on my screen. The system took a long time to get used to, and even then I never felt accurate with any of my guns. In the end, I chose the shotgun from the range of starting weapons as its spread gave the best chance to actually hit the mummies and scorpions rushing at me. The bullet upgrades I found helped – I opted for a crystal that occasionally freezes enemies solid – but I also relied heavily on the powerful melee uppercut attack to dispatch foes. This didn’t feel ideal. I had a problem with enemy spawns, too. On a couple of occasions, enemies materialised in front of me, and found I was being attacked before the mummy in my path was even fully formed. Couple that with the restrictive aiming angle and, sure, I felt as overwhelmed as any horde shooter should want me to be, but for the wrong reasons. Enemies got more hits in than they should have. It just felt unfair. 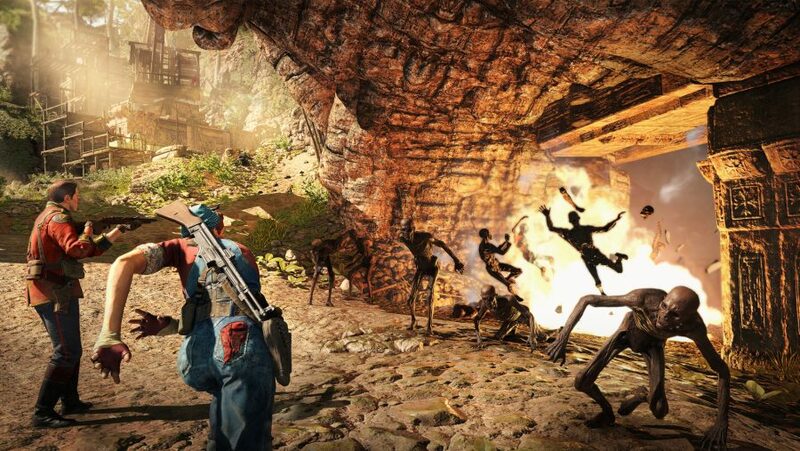 Aside from the main mode, Strange Brigade has two alternatives: Horde Mode and Score Attack. Horde mode isn’t worth getting excited about. You start with rubbish sidearms to push back small waves of weak mummies, but as you kill enemies you earn gold to buy better shooters, alongside upgrades to your abilities. I’m told the mode can, technically, go on forever, but your team should eventually become overwhelmed by sheer numbers. Brutalising the first 15 waves was certainly satisfying. Score Attack was a little more interesting and reminds me of Orcs Must Die!. You’re given a time limit to get through a level, facing a stupendous number of enemies – it’s not easy. On the flip side, you can activate traps to thin the crowd, and there are plenty of ridiculously powerful ‘prototype weapons’ – a rarity in the main campaign, but in abundance here – that help you rack up multipliers for that all-important big score. On top of that are the standard ‘take no damage’ and ‘don’t die’ challenges to work on, too. The mode is a decent change of pace and I found myself getting into optimising my playstyle after a few runs. Strange Brigade should be fun with friends, if not for the gunplay, but the multitude of puns and dad jokes it has to offer. Work is needed, then, but I can’t hold a grudge against a game that lets you play as a shotgunning woman from Lancaster who gets her kicks punching mummies in the face.